Written by: Different Roads to Learning on July 1, 2014.on June 30, 2014. 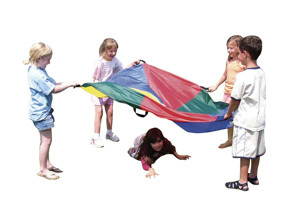 This entry was posted in autism, Development, Modified Instructions for Games & Toys, Pick of the Week, Playskills, Reinforcement and tagged language development, learning activities for summer, Parachute Play, reinforcement, Sam Blanco BCBA, social skills, teaching by Different Roads to Learning. Bookmark the permalink.